Deception Bay Flexible Learning Centre began as an inclusive learning community in 2006 and is part of Edmund Rice Education Australia, a national and unified network of Australian schools and educational entities. As a Catholic school in the Edmund Rice tradition Deception Bay Flexible Learning Centre embraces a Charter which upholds four touchstones – Liberating Education, Inclusive Community, Justice and Solidarity and Gospel Spirituality. These touchstones, an authentic expression of the spirit of Edmund Rice founder of the Christian Brothers, underpin its educational endeavour. 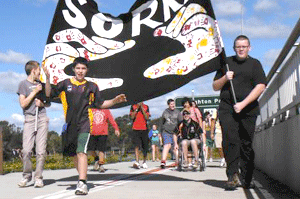 Deception Bay Flexible Learning Centre is co-educational and invites secondary school age young people into a community that encourages and nurtures strong healthy life giving relationships that support lifelong learning. Deception Bay Flexible Learning Centre has a strong focus on social justice and stands in solidarity with disenfranchised young people of all social, cultural and religious backgrounds. The philosophy also has a practical focus, based in the application of four core principles of “Respect” (for self, others and environment), “Safe and Legal” environment, “Participation” (have a go) and “Honesty” (being fair dinkum) among all participants of the Deception Bay Flexible Learning Centre. This is evident in the ways the organisational culture and practices are shaped through the application of these principles. In essence, the principles establish a “common ground” among staff, students and parents, a collective forum, where the means to resolve conflict, negotiate learning, recognise rights, responsibilities and consequences are modelled and explored, both within the group, and individually and as members of the broader community. Deception Bay Flexible Learning Centre (DBFLC) is a place young people can come if you want to finish your secondary schooling in a friendly, supportive, fun and flexible environment. We work hard to build honest and authentic relationships with young people and their families, supporting and celebrating the uniqueness and dignity of each young person. We offer a rich and inclusive education program, with a great staff team and impressive facilities including a massive sports hall, deadly music studio, parents’ room and fully-equipped manual arts workshop. . 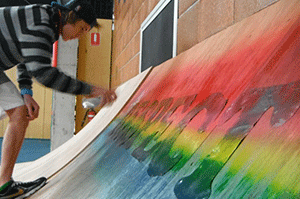 The aim of the Deception Bay Flexible Learning Centre is to respond to the complex needs of disenfranchised young people who have been marginalised from mainstream education. The Deception Bay Flexible Learning Centre provides holistic learning experiences that address the social needs of students and promotes their emotional, cognitive, spiritual and academic development. The purpose of the learning experiences is to empower young people to take personal responsibility for their actions and learning, achieve greater autonomy and self-reliance and to engage in the transition to further education and/or employment. Students are enrolled from a variety of language, cultural, ethnic and religious backgrounds, with particular sensitivity to Indigenous culture, and from backgrounds of socio-economic disadvantage. 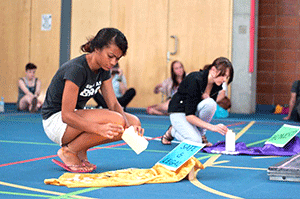 Students are exposed to learning experiences that develop understanding and appreciation of diverse cultural values that constitute Australian society. Learning is focused around the individual needs of students and progress is documented and monitored. 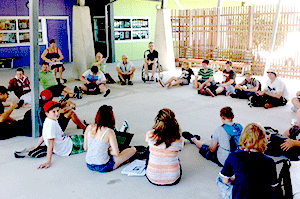 Students, in conjunction with their teachers, youth workers and education support workers, discuss career aspirations and draft learning plans with articulated pathways to further education and/or vocational education and training. .
Deception Bay Flexible Learning Centre provides extensive opportunities for students to participate in co curricular activities at their level and within their areas of interest. Participation is encouraged. The broad range of opportunities or choices for students includes activities that are described as cultural, sporting, intellectual and or service related. Afternoons and Friday morning program electives give young people an opportunity to engage across year levels in activities including Dance, Gardening, Cooking, Skate „n‟ BMX, Board Games, Krafty Katz, Sport, Art & Craft, Hospitality, Workshop, Avago, Tutorials, Music recording and Instrumental Music.